In times of increasing technological complexity and innovation dynamics, firms are no longer willing or able to have all the necessary knowledge and competences available within their enterprises. It is becoming increasingly more important for firms to explore and exploit external sources of knowledge and innovation impulses if they follow an open innovation approach. 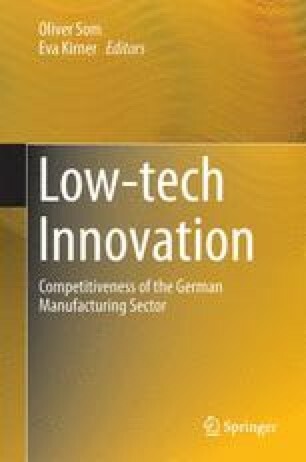 Based on novel empirical firm-level data, this chapter examines the types of external sources of knowledge and innovation impulses on which firms with different levels of R&D intensity rely and the types of external partners with which they interact in innovation collaborations. The findings show that both non-R&D-performing and non-R&D-intensive firms succeed in tapping into external sources of innovation knowledge but that they are more oriented towards practical and implicit stocks of knowledge coming from partners along their value chains or markets compared with R&D-intensive firms. As a result, both types of firms have large unused potential with regard to their collaboration activities, especially those with external R&D organisations. Barge-Gil, A., Nieto, M. J., & Santamaría, L. (2008). Hidden innovators: The role of non-R&D activities. Paper presented at the 25th Celebration Conference 2008 on Entrepreneurship and Innovation—Organisations, Institutions, Systems and Regions. Copenhagen, CBS, Denmark, June 17–20, 2008, available at: http://www2.druid.dk/conferences/viewpaper.php?id=3352&cf=29 (last accessed on 4th of May 2014). Czarnitzki, D., & Wastyn, A. (2009). Does professional knowledge management improve innovation performance at the firm level? ZEW Discussion Paper No. 09-067, Centre for European Economic Research. ftp://ftp.zew.de/pub/zew-docs/dp/dp09067.pdf. Accessed 7 April 2010. David, P. (1996). Science reorganized? Postmodern visions of research and the curse of success. MERIT Research Memoranda, No. 2-96-002, http://www.merit.unu.edu/publications/rmpdf/1996/rm1996-002.pdf. Accessed 13 June 2010.